*We no longer grow this item but feel free to peruse the information. 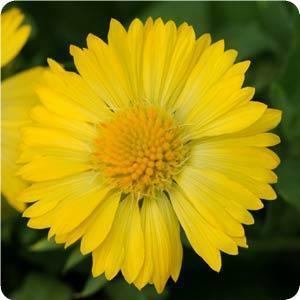 Description: You will have continuous color with Mesa Yellow Gaillardia! The yellow button center is surrounded with slender yellow petals on well-branched green foliage. The flowers grow to a uniform height which is where they get the name ‘mesa’ after the flat-topped mountains of the southwest. They are very vigorous, blooming all season long and even into the fall in warmer climates. Spacing: Plant 20″ to 24″ apart. Height: Grows 16″ to 18″ tall. How To Grow: Plant in full sun. Outstanding Features: Mesa Yellow attracts butterflies and birds. Does well in most any weather condition. Tips: Keep soil moist until established and then it is drought tolerant.